I finished another couple of paintings this week for my January show at Viewpoints Gallery, focused on Autumn colors. I took some great reference photos of the Santa Inez Valley when I was there for my Ted Georschner workshop a few months back. The other painting I’m working on is much more abstract and colorist. I’m enjoying going back and forth between the two genres, although I am concerned that the show may suffer from consistency. Perhaps this is a good thing. The dam printer is taking it’s time with my postcards! They probably won’t go out until just before Christmas. Check out Camille Przwodeck’s new Wetlands Series. I continue to make progress as I prepare for my January show. I haven’t come up with a great name…So for now, it will be the “Autumn Colors Show”. Yuck…I know. 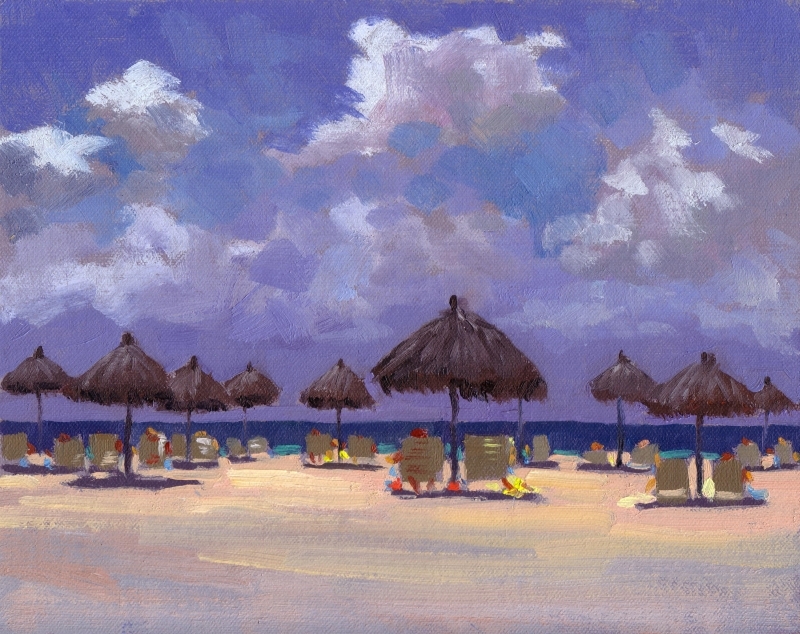 Let me know if you think of something better.I typically start with small plein air studies, and then work up. These two are 11x14s, and I’m working no two more 20x24s. There are a LOT of images of Aspens, perhaps too many. 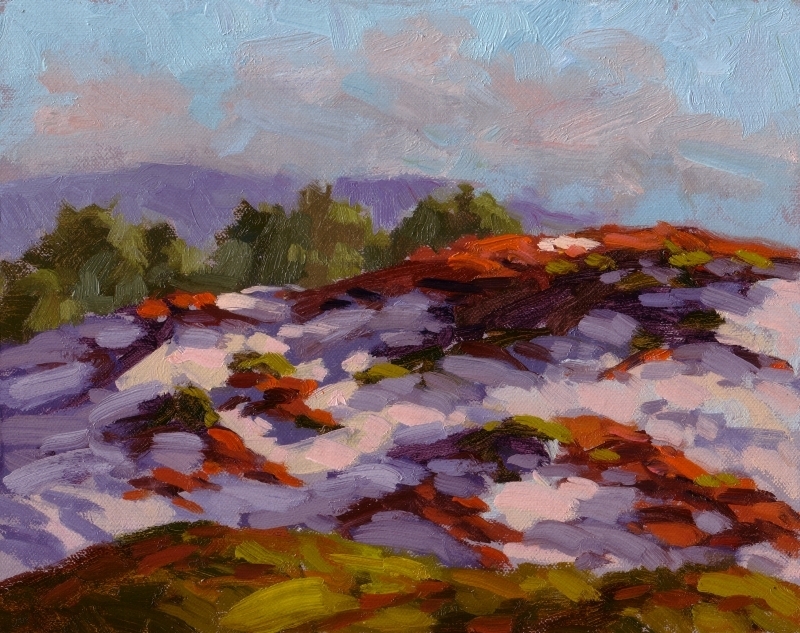 I also have some great sand dunes with red ivy from the Asilomar series. 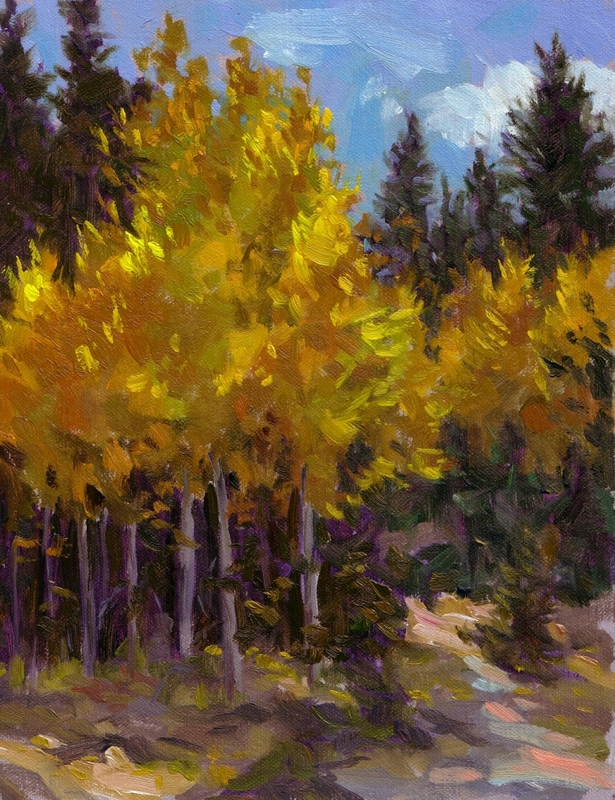 Since those were done in Fall and represent those colors, they’ll fit in this next show to counter-balance the Aspens. I am having trouble finding time to paint, now that I’m temporarily working full time. I hope to finish the large works on weekends and the dead work week between Christmas and New Years. The nice thing is I’ve already had collectors ask if they can buy some of these works before the show. I can spare a couple, but I do need to keep a quality group for the gallery. Well, as always, if you’d like to share your impressions of these series, shoot me an email. I can’t believe I haven’t written in this blog for a month! It’s been a busy time. 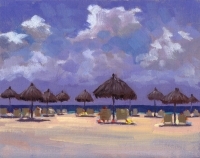 I started a 5-6 month consulting contract to refill my $ coffers, and I went to Aruba over Thanksgiving week. I was really looking forward to this trip, and while there were some highlights, in general it was too hot/humid to paint much. 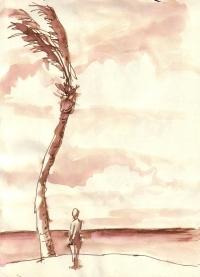 I did complete three paintings, and a number of pen/ink wash sketches. The island’s landscape is unique–at least as far as I’ve seen in the Caribbean. It’s located 20 miles off the coast of Venezuela, so it’s far south which gives it a particularly arid climate. Cactus and iguana share the island with an oil refinery–yet, an oil refinery. It was surreal to sit under a palappa at Baby Beach and see this refinery spewing green smoke and fire across the way. We also noticed a lot starving dogs–nice vacation, huh? So, we bought a box of dog biscuits and gave them out as we toured around. In the end, I may do some studio paintings from my photos. We’ll see. 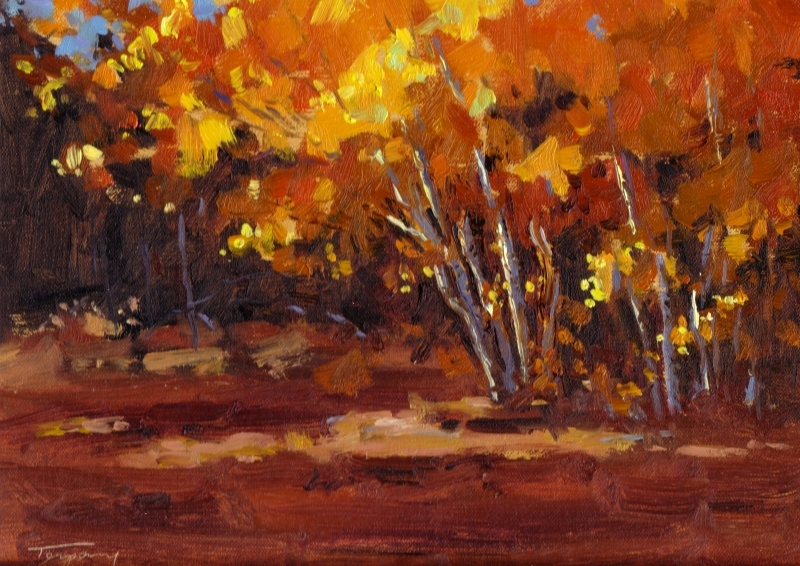 I want to finish my series of Autumn paintings for my January show, so we’ll see if I have time. When I’m out painting, I’m often asked “How long does it take you to paint that?” I know most people are well-meaning and just plain curious, but the reality is an entire lifetime of experience and years of training go into each work of art. You can’t translate two hours of work into an hourly rate. If you did, all artist’s would be rich! But guess what, the vast majority are poor. Why? The simple answer is consistency. The greats can create great paintings, one after the other, while the rest (like me) will maybe decide to show 1 in 4 paintings in a gallery, and then go on to sell 1 in 4 of those. So, do the math 🙂 I had to paint approximately 1,400 paintings to paint this little masterpiece. What does all this have to do with this painting? Well, it’s one of those real winners. One in which everything I’ve every learned came together at once. It practically “painted itself”. I often hear that phrase from artist’s when a painting is going well. Everything you’ve learned becomes automatic, and you’re able to respond in an emotional way to the subject. Not in a complex, overt way, but one of elegant simplicity. This is a simple painting–look how few colors there are–but to me, it just glows. So, more to come! I’m still working on my Aspen Series, and hope to have them done for my show in January, 2006. I know this study is a winner, and will end up being a 20×24, or perhaps even bigger. 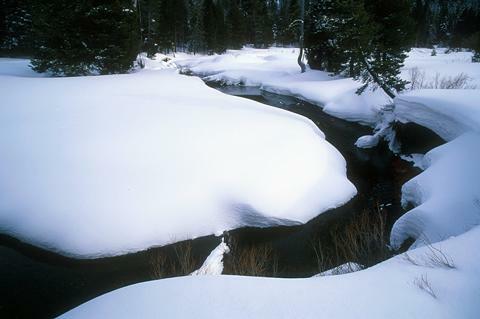 I still have a 3’x5′ canvas crowding my studio, white as winter, ready for the glow of Fall. I hosted a joint OPA (Oil Painter’s of America) / Verde Artist Guild paint-out yesterday at the Conservatory of Flowers in Golden Gate Park. Although the morning started in drizzle, it cleared up beautifully. We had around 30-40 artists attend from all over the state.I spent most of my time “hosting”, ie, walking around and saying hello, making people feel welcome. I did do one “quickie” painting (top image). It was so great to see this many artist’s create their own interpretations of this great old building. I think next time maybe we’ll organize a show around these events and invite collector’s. 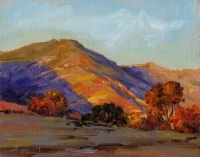 Have just spent a couple of days painting the Fall colors of the Sierras. Incredible Aspens, and even the ground cover and bushes have incredible reds, yellows and oranges. I plan on doing a series on this subject, which should be ready for my December show at Viewpoints Gallery. Enjoy! 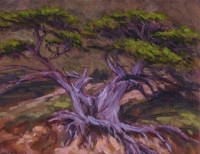 Spent a couple of days painting in the Carmel area (Point Lobos, Asilomoar, Pacific Grove). I’m really fascinated right now by the incredible color and design possibilities sand dunes covered in ice plant. The complementary red/green combinations are powerful, especially in the late afternoon and early morning light. This paitning was done around 6pm. 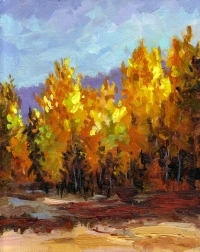 I intend on painting a series of this subject, perhaps for hanging at Viewpoints Gallery in November. Another day at Point Lobos! Wow, I love this place. Unfortunately, again, it was foggy. The coast was clear all the way down to Carmel. I could have painted in sun elsewhere, but I love the deep water and rocks of this great park. Here, I focused on capturing the turbulence of the water played against the steadfast nature of the rocks. This will be in my first solo show, opening this weekend. 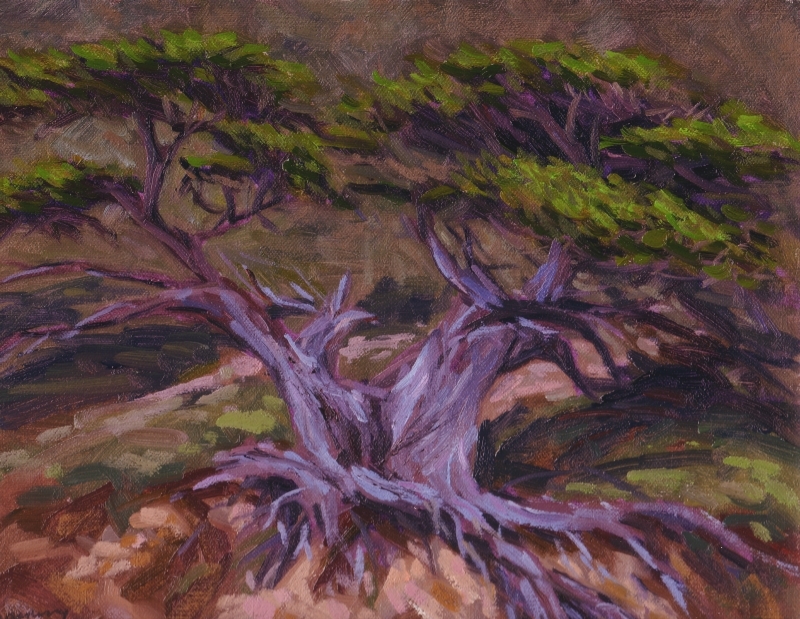 I finished this plein air painting “The Old Veteran” at Point Lobos, CA — one of my favorite painting locations. It was a cloudy day, but this tree (really named “The Old Veteran”) really caught my eye. It communicated incredible strength, age, fortitude, and at the same time, graceful pose. I think this is a keeper. I may enter in some shows, but don’t intend to sell. It’s hard for to part with some paintings. Brian Blood’s painting of the same tree! Hay, is that Point Reyes Station? I finished this studio painting today. Painting “plein air” (outside) really helps develop the skills required for studio work. In this paiinting, I was able to use that knowledge and take my time making this painting work. 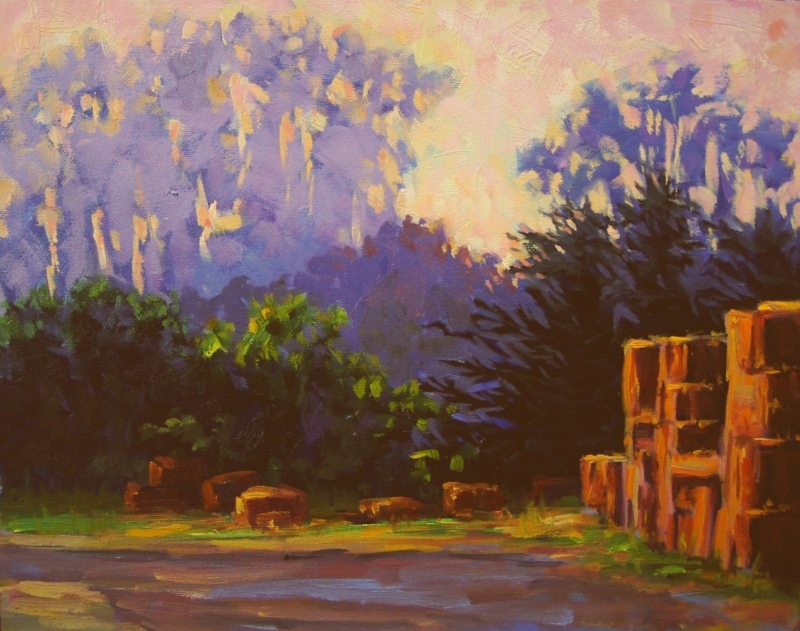 I like the feeling of “golden light” here, and the overall color harmony. This will be in my Solo Show opening September 5th. 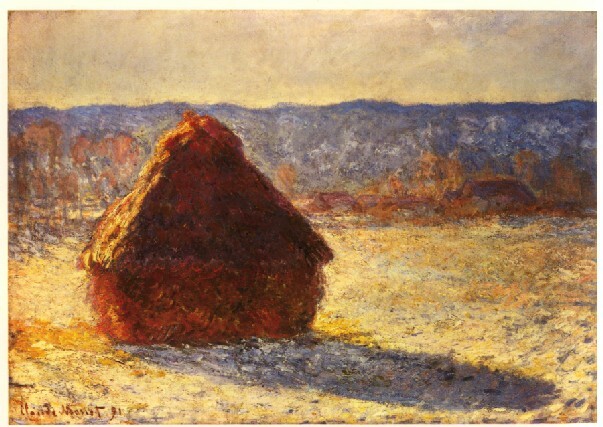 “Hay in Art”, a quirky site showing bales of hay as the subject of art. 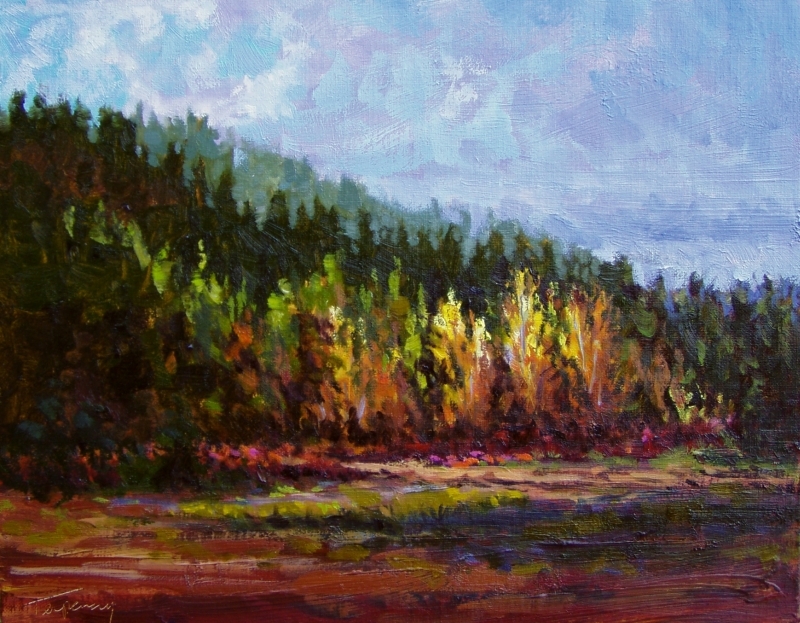 “Blackwood Stream, Morning”.I started this small plein air painting on a recent trip to Lake Tahoe, where I painted with my friend Andy Skaff. 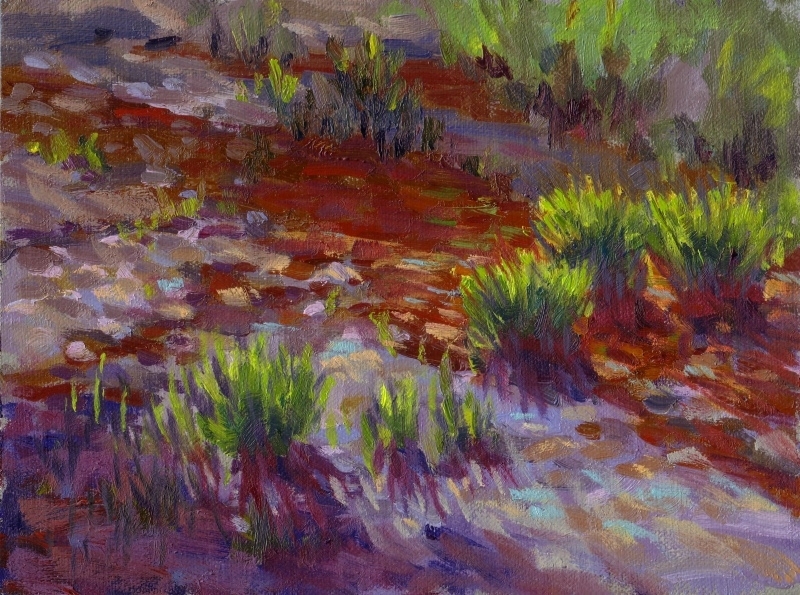 The light hitting the top of these grasses really drew me in, as well as the color of the shadow areas. 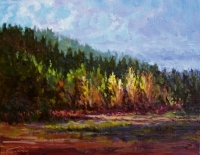 While painting this, I met another plein air artist from Argentina! We had a good chat. I ended up finishing this in the studio, balancing the composition a bit here and there, but leaving the color harmony in tact.